Found on the Sentinel Plain, southwestern Maricopa Co., Arizona. 30 March 2010. Actual size is about 20 mm. The exoskeleton of these beetles is indeed extremely tough. Hikers often find the ancient, empty shells of these beetles many years after the insect has died. Hobbyists have reported keeping these insects alive in captivity for 10 years. They feed on a wide range of materials such as fruit, dead leaves and dead insects. The immature stage is a grub that lives in the soil presumably feeding upon decayed plant material. 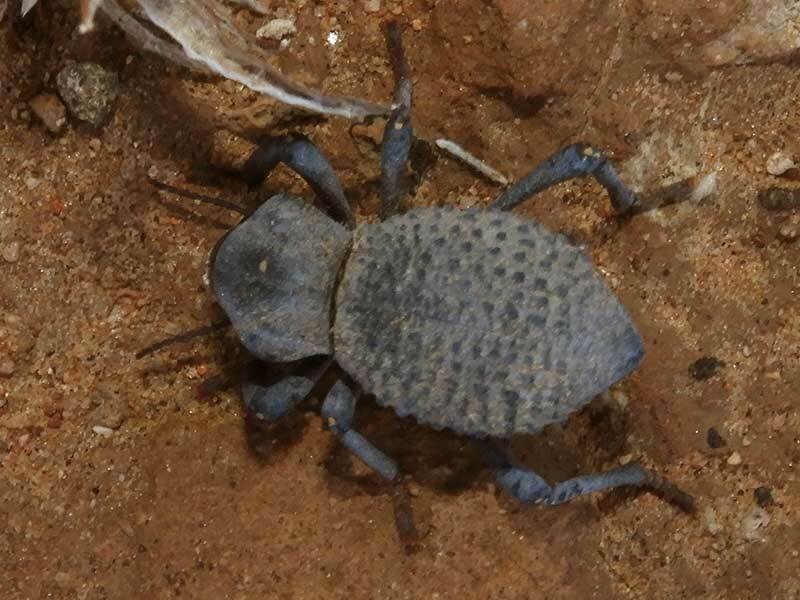 There are two insects I've called Ironclad Beetles. The other is Cryptoglossa variolosa Both resemble Pinacate Beetles -- Eleodes spp. but do not release noxious odor and do not do the head stands.